For Viola and Piano. Composed by Astor Piazzolla (1921-1992). Arranged by Brett L. Allen. Solo part with piano reduction. With Standard notation. 29 + 8 pages. Berben #EB5753. Published by Berben (PR.514054400). 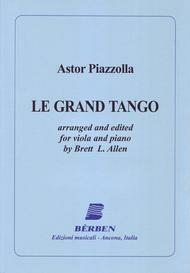 Astor Piazzolla's well-loved Le Grand Tango has been arranged here for solo viola with piano. A perfect concert piece. Also available for viola with string orchestra and piano. Solo Viola and Piano, and an orchestrated version for Solo Viola, String Orchestra and Piano. The Solo Viola part is identical in both versions, and the piano accompaniment coordinates seamlessly with the orchestra version. 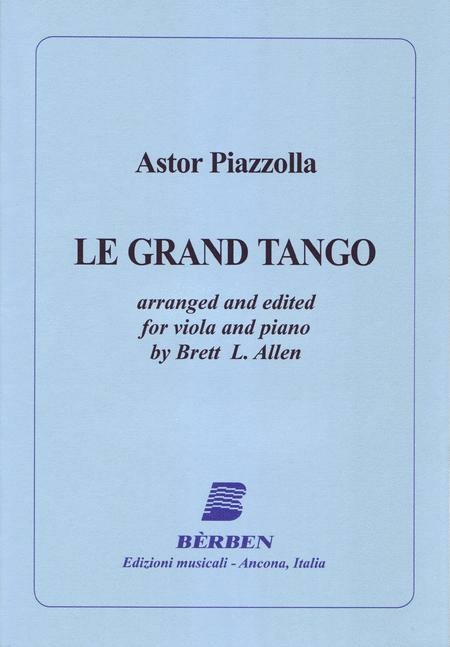 This solo viola version of Le Grand Tango is providing a new generation of violists with an exciting concert piece that is proving to be an instant favorite with audiences. Brett L Allen is a violist with nearly 40 years professional orchestral experience. He is Assistant Principal Viola of the Columbus (OH) Symphony Orchestra and a member of the Pro Musica Chamber Orchestra. He is published by Oxford University Press, Berben, and Watchfire Music.